How many weekly lessons each subject requires. If I had not kept in consideration these 2 factors, our 1st-grade schedule/weekly lesson planner would look much different, and our days would be much longer. In general, our 1st-grade school days last about 2 hours. 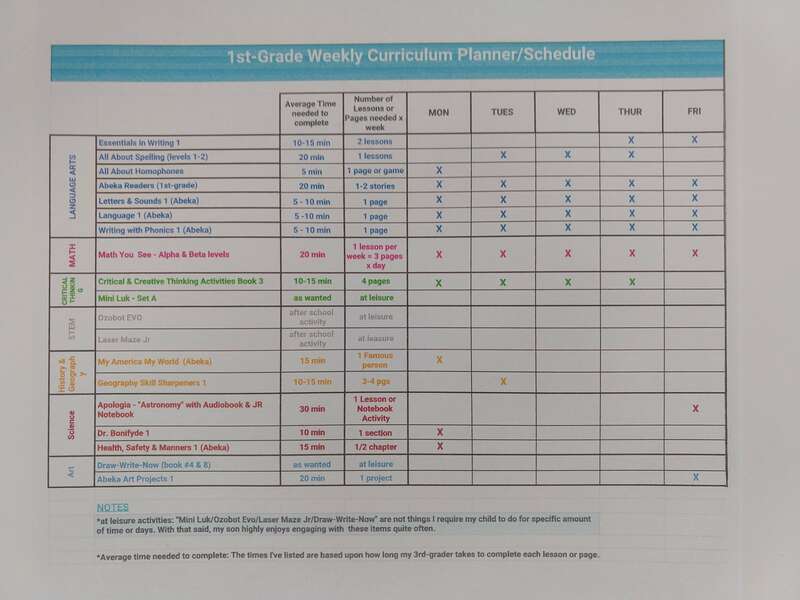 When piecing together our 1st-grade curriculum, scheduling had a lot to do with my decision to use a certain curriculum or not. As a homeschooling mom of different aged kids, many factors come into play when I piece together each of their school grade years. One of the first things I look for in a curriculum is to see how teacher intensive its planning and scheduling is. My children are still young and need my assistance and teachings in some areas, however, for the most part, our curriculum picks promote independence from early on. Weekly lessons needed to complete within a 34/36 week school year. Another very important factor for me is to know how many lessons a week are needed for us to finish a curriculum within a school year. Although we do math and reading throughout summer (on a very relaxed schedule), all other subjects are to be finished within a 34-36 week school year. In general, when making my curriculum picks for History, Geography, and Science, I like to know they can be tackled once a week. I’ve come across many wonderful curricula picks for these subjects, however, when it came to scheduling many didn’t make the cut because of its planning and scheduling requirements. In my opinion, in 1st-grade History, Science, Geography, and some other subjects should be covered just for exposure (if at all), not for mastering. In all honesty during these early grades, my main concern is for my 7-yr-old son to master math and reading, get a solid foundation in spelling, and a gentle exposure to writing. All other subjects covered during these elementary years are done in “moderation”. Each year when I put together our curriculums, if our “non-core subjects” require intensive scheduling and planning to be finished within a school year, then I immediately take them out of consideration. Please know that although I thrive on structure, I’ve noticed over my years of homeschooling, sometimes sticking to a weekly planner too religiously can backfire too. When I began homeschooling my firstborn I was using Abeka. Each day was already planned for you and at the time I felt without it, I would be overly relaxed. When 2 years later I moved on using a customized Timberdoodle curriculum, I absolutely didn’t expect to fall in love with their genius idea of a weekly checklist instead! Their weekly checklist vs. Abeka’s strict daily schedule, helped us understand how being flexible doesn’t necessarily mean slacking off. As homeschooling families, we need to keep in consideration life events will get in the way of our weekly planning more than we would like it to, and flexibility is the key in order not to lose our groove. You will see how I pencil in a certain subject on certain days of the week, however, if appointments or illnesses get in the way I shuffle around as needed. I found keeping an open and flexible approach to our weekly-schedule helps me not get too stressed when I don’t make it on time to cover certain subjects on given days. I also found, picking curriculums that don’t require a strict 4-5 day a week lessons, helps us keep a more realistic homeschool schedule with low-stress level. Below you will find a list of our 1st-grade curriculum picks divided by subjects and I’ve also include Amazon and Christianbook.com links for your convenience, where you can look them up and purchase if and when you decide. 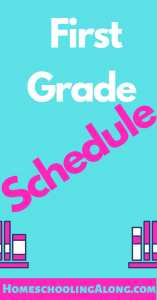 Immediately following, you will find our 3rd-grade weekly planner and schedule grid. Feel free to print it out if it can be of help to your homeschooling journey. **Here is also the link to my post reviewing our 1st-grade curriculum picks →”1st-Grade Just Right, The Second Time Around“. Spelling You See B (book A), 1 page x day; followed by All About Spelling 1. 1 lesson x week ←(click on the link to read my full review). All About Homophones 1 sheet x week (starting in the 2nd semester). ↑↑↑ Here is a link to the full parent L.A. kit. We only use the Lessons Plan book, Reading 1 key & the Basic Phonics chart. We DO NOT use the Spelling and Creative writing part of this curriculum. ↑↑↑We DO NOT use the Spelling & Poetry 1 book of the child kit. We found everything else in the kit to be essentials for our L.A. course of studies. ↑↑↑ We found this CD to be fundamental to learning well the phonics sounds taught throughout the program. ↑↑↑ We DID NOT use book#2 of this set but instead moved on to “All About Spelling 1”. Combining the 2 worked phenomenally for us. “Therefore do not worry about tomorrow, for tomorrow will worry about itself”.